The Government Representative in the Senate conveys the views of the Senate to the Government and vice-versa. The Government Representative in the Senate is the first point of contact between the Government and the Senate, working at once to shepherd Government bills through the Upper Chamber and to champion renewal in the changing institution. Formerly stylized as the Government Leader in the Senate, the change of title under the current Government reflects the change of role, as the Government Representative is not part of a partisan group, does not lead a caucus and has no power to direct the votes of other Senators. The Government Representative is responsible for selecting Senate sponsors for Government bills and for answering on the Government’s behalf during Senate Question Period. The role also includes working closely with Senate leadership to plan the legislative agenda, ensuring that all bills are considered in a timely manner. Senator Peter Harder has served as Government Representative in the Senate since April 2016. In the past, the Government Leader often served as a cabinet minister. Now, the Government Representative is a member of the Privy Council but not a minister, attending cabinet meetings as appropriate to discuss the legislative agenda. The Government Representative communicates regularly with the Government, discussing timelines for the debates and votes on Government bills and motions, as well as when to expect bills from the House of Commons for Senate consideration. The Government Representative also conveys the views of the Senate on particular bills, which includes pointing out when Senators have concerns about certain parts of the legislation. In some cases, the Government may agree to make changes to the bill, or find other ways to accommodate concerns expressed by the Upper Chamber. 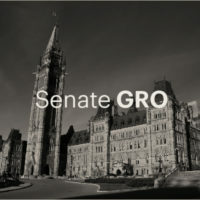 The Government Representative may also indicate to the Senate the timing of the Government’s agenda to pass a bill (as was the case for legislation to legalize cannabis in Canada), whether there are court-imposed deadlines on legislation and convey the Government’s position on proposed Senate amendments. In addition to answering on the Government’s behalf in the Senate chamber, the Government Representative also organizes the regular appearance of cabinet ministers during Senate Question Period. Further, the Government Representative periodically hosts all-Senators meetings to share information on Government bills and priorities. Under the old system, the Government Leader would select caucus members to sponsor Government bills—a task that empowered a Senator to champion a bill through the Upper Chamber, in a similar fashion that a cabinet minister would shepherd a bill through the House of Commons. Because the Government Representative no longer leads a caucus, Senate sponsors for Government bills are selected on a volunteer basis, regardless of affiliation. A Senator’s expertise, experience and policy judgments may come into consideration when selecting a sponsor. The Government Representative Office works with Ministers’ offices to ensure Senate sponsors have all the information and support they need to play a leadership role as a bill is debated in the Senate. The Government Representative Office also works with ministerial offices to organize technical briefings for all Senators on each piece of Government legislation. The Government Representative also acts as a champion of reforming the Upper Chamber and, in this role, conveys ideas, takes on speaking engagements and provides best advice on how the Senate can pursue the goal of becoming a less partisan, more independent, accountable and transparent body that acts as a complementary chamber to the House of Commons. Senator Peter Harder currently serves as the Government Representative in the Senate.